Lip Sync Battle on Spike is hit or miss depending on the week, but when the contestants really go for it, the show can be a pleasure to watch. This week, Agents of S.H.I.E.L.D. actor Clark Gregg is going to face off against Agent Carter actress Hayley Atwell, and we already know Clark Gregg is going to come out guns buns blazing. You can check him out in a really tight get-up, performing the Britney Spears classic “Toxic,” below. I also love that Chrissy Teigen is supporting the actor by wearing her own flight attendant hat, as well. She’s not the only person who looks like she is having a blast. Hayley Atwell is clearly also a Brit Brit fan, and is doing her own singing on the sidelines. Britney Spears songs may seem a little out of place in the Marvel universe, but they rock on Lip Sync Battle. 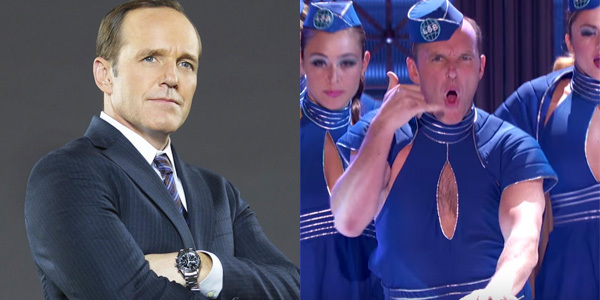 The upcoming episode of Lip Sync Battle doesn’t air until this Thursday, and I don’t have any idea how Hayley Atwell could possibly top Clark Gregg’s performance. It would have to be an Anne Hathaway “Wrecking Ball” type of wild moment in order to come anywhere close. Maybe she has it in her and maybe she doesn’t. I’m sure we’ll find out later this week. Lip Sync Battle is currently airing its second season over at Spike. Things have been going pretty well for the hit series. Back in January--shortly after Channing Tatum and his wife had an epic night on the series--Spike decided to renew the reality competition series for Season 3. Luckily for fans, there are still quite a few battles left in Season 2. You can catch new episodes of Lip Sync Battle on Thursday nights at 10 p.m. ET, only on Spike. In addition, you can see what else TV has coming up this summer with our TV premiere schedule.